The origin of the word pencil is unclear. It may derive from pencillis (Latin, "little tail) or pincel (French, "little paintbrush"). Before erasers existed, bread crumbs were use to erase mistakes. Hyman Lipman patented a pencil with an eraser attached in 1858. 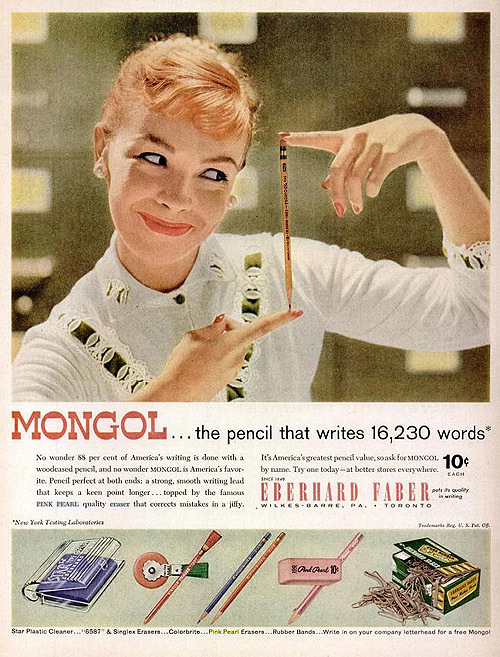 Pencils were used on early American and Soviet space missions because they can write in zero gravity. Pencils can also write in water! John Steinbeck wrote with pencils and sometimes used 60 a day. Ernest Hemingway also preferred to write with pencils. Johnny Carson played with pencils on The Tonight Show. The pencils were specially made with erasers for safety. Roald Dahl wrote with pencil and kept 6 sharpened pencils ready at all times. Thomas Edison used special pencils that were thicker than normal pencils. Henry David Thoreau's father owned a pencil making business, and Thoreau designed his own pencils. Pencils do not contain lead. They contain graphite and clay. 14 billion pencils are produced each year worldwide. The average pencil can draw a line 35 miles long. It can also write 17,000 words. If you dream of a pencil, it means you think a relationship may not last long. So what is your thought on pencils ... Love them? Use them to write, to draw? Prefer pens? I'd love to hear from you in the comments, below. Awesome list and I totally learned something new -- that pencils can write in water!! Thanks for stopping by! Jenn, I agree about Roald Dahl -- he seemed like such a wonderfully eccentric writer; that story did not surprise me at all!